The three main Islands that make up the Maltese Archipelago - Malta, the largest; Gozo, the mythical isle of Calypso; and tiny Comino, famous for its Blue Lagoon - make up an exceptional diving location at the heart of the Mediterranean. The Islands encourage you to discover their natural harbours, bays, sheltered creeks, cliffs, reefs and wrecks. The sea and wonderful climate here offers some of the most calm and clear waters in the world. The three main Islands that make up the Maltese Archipelago - Malta, the largest; Gozo, the mythical isle of Calypso; and tiny Comino, famous for its Blue Lagoon - make up an exceptional diving location at the heart of the Mediterranean. The Islands encourage you to discover their natural harbours, bays, sheltered creeks, cliffs, reefs and wrecks. The sea and wonderful climate here offers some of the most calm and clear waters in the world. Visibility is first-rate, down to around 30 meters, making the Maltese Islands a dream destination for underwater photography. Marine life flourishes in a lively show of colours. Interested? Convinced? 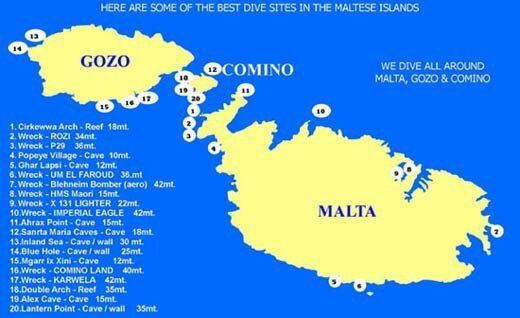 Then it is time for action, come and join us to experience the excitement and adventure of scuba diving around the Maltese Archipelago.